How an early-20th-century inventor based in Gloucester created the frozen food industry and a business empire that bears his name. 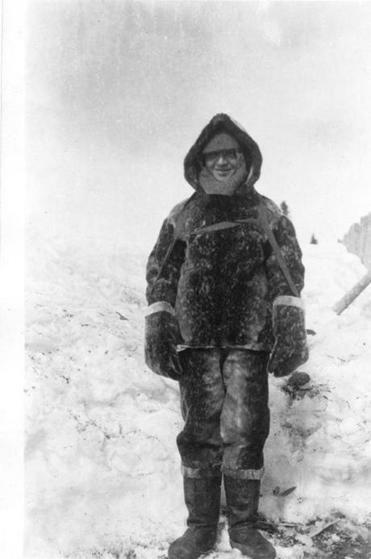 Birdseye in Canada’s Labrador, circa 1912, where he began thinking of building a frozen-food business. Excerpted from Birdseye: The Adventures of a Curious Man, by Mark Kurlansky, copyright © 2012 by Mark Kurlansky, available May 8. Published by arrangement with Doubleday, an imprint of the Knopf Doubleday Publishing Group, a division of Random House Inc. HE HAD WORKED for the United States government in the frontier West and as a fur trapper in Canada’s frigid Labrador, but the life of adventure seemed well behind Clarence Birdseye in 1920. That year, he switched jobs again and became the assistant to the president of the US Fisheries Association, a lobbying group that worked on improving the commercial fishing industry. That was the big Birdseye idea. If he could find a way to deliver fish to the customer in the same condition as it landed on the docks, many more people would eat fish and the fishing business could greatly expand. He developed an inexpensive container that would keep fish chilled until it arrived in market, but it was still not comparable to fresh fish. There had to be a better solution. Birdseye kept thinking about his constant struggle for “fresh food” in Labrador, the mainland portion of Newfoundland, some years earlier. To his surprise, the frozen food there was not unpleasant. In fact, it tasted just like fresh. What accounted for the difference? The Inuit fished in holes in the ice, pulled out a trout, and it instantly froze in the 30-below-zero air. When they cooked it, it tasted like fresh fish. In fact, sometimes the Inuit would put the frozen fish in water and thaw it and the fish would start swimming, still live. Birdseye noticed that meat and fish were not as good when frozen in the early or late winter, and he wondered why. He would cut paper-thin slices and remark that the food frozen at those times did not have the same texture as the food frozen in the dead of winter. Everyone knew that the height of winter was the best freezing season. But Birdseye had figured out why. Looking at the inferior frozen food with its grainy texture and leaking juices, he realized that the ice crystals were too big. If food is frozen too slowly, the larger crystals damage the cellular structure. He started experimenting with vegetables. When the weather turned very cold, he put an inch of seawater in a barrel. Then he laid down a thin layer of cabbage leaves. Once this was frozen, he added another inch of seawater and another layer of cabbage. He repeated this until he had a full barrel. When he wanted some cabbage for his family, he would lob off a chunk with an ax and cook it. He found that it tasted exactly like cooked fresh cabbage. Photo from Cape Ann Museum; Birds Eye is a registered trademark of Pinnacle Foods Group LLC. The firm’s building on the Gloucester waterfront in 1930. BY THE 1920S, European scientists had already expounded on fast-freezing and the principals of crystallization, but in reality most frozen food was still slow frozen and of very poor quality. And as more frozen food became available, the quality got worse. The problem was that because of its bad reputation, it only fetched the lowest prices and so had to be made from the cheapest and poorest quality fresh food. State laws were passed to try to protect consumers from the terrible frozen food. New York even banned serving it in its prisons. The more Birdseye thought about quick freezing, the more he became convinced that this was an idea with a huge potential. In 1922, he left his job with the Fisheries Association and moved to New Jersey, where he persuaded an ice cream company to let him use of a section of its plant to conduct experiments. Birdseye discovered that all that was necessary for quick freezing was that the temperature pass very quickly out of the first freezing temperature range, which is from 33 degrees to 23 degrees Fahrenheit. Below that, crystallization is rapid and crystals become very small. But to speed up freezing, smaller amounts had to be frozen. Before Birdseye, freezing was a wholesale business, and huge blocks of food, including whole sides of beef, were frozen. Fruit was frozen into 400-pound blocks. The food was placed in a barely freezing environment and frozen over a number of days. But Birdseye froze one fish at a time, and froze them quickly. In 1924, Birdseye was awarded his first patent for this quick-freezing process. He was out of money, but he believed that he was on the path to an important innovation. Though they had three small children to raise and a fourth expected, he and his wife, Eleanor, knew what to do. They sold their life insurance policy and their house and moved to Gloucester. Birdseye working in his food laboratory on the second floor in 1943. WHEN THE BIRDSEYES ARRIVED, Gloucester had just celebrated its 300th birthday. Founded in 1623 as an English fishing station, it remained, and still is, one of the leading fishing ports of the United States. Although he intended to sell frozen fish through his company, Birdseye’s real goal was to develop and patent ideas for frozen food. In other words, he was not as interested in founding a company as he was in launching a whole new industry. He named his company General Seafoods Corp., and he imagined frozen food, still an oddity, becoming a huge industry in which his company held a place comparable to General Electric and General Motors in their fields. The company’s first manager, Joe Guinane, recalled in 1960 that Birdseye was a tireless tester. “There was not a frozen-food item that I do not recall Birdseye experimenting with at one time or another in the early days. He tried all kinds of things — not only seafood, meats, and vegetables, but baked and unbaked goods, as well as cooked foods.” He envisioned the entire future of frozen food. General Seafoods began with haddock fillets frozen in rectangular cardboard boxes. It produced thousands of pounds of the boxed frozen fillets in its building on Gloucester’s waterfront. Birdseye’s omnivorous tendencies were once again in full play. He prowled the docks for anything unusual that he could try freezing. He froze whale, shark, and porpoise, and, according to one account, he even found an alligator to freeze. As well as inventing a new machine for the old technique of brining, Birdseye also invented a fish-scaling device. In July 1925, he wrote to a backer that one of his machines could fillet 23½ haddock a minute, and he was anticipating a new and better motor that might do as many as 50 fish a minute. People from filleting operations at the Boston Fish Pier and from Nova Scotia came to Gloucester to look at Birdseye’s work. The men from Boston told him that in the next 12 months the Boston Fish Pier planned to produce and sell 10 million pounds of haddock fillets. He claimed to have invented a way of producing frozen food “as a practical, commercial article of commerce.” Birdseye accomplished this by packing food very tightly to eliminate air, in cartons holding a 2-inch-thick block, and pressing these cartons between two plates that were kept at between minus 20 and minus 50 degrees Fahrenheit. The blocks not only froze the food solid but also compacted it into a tight rectangle, assuring complete freezing in a short period of time and no spaces for bacteria to enter. Without having made a single scientific breakthrough, Clarence Birdseye had developed a process for freezing food on which an entire industry was founded.